Savita has developed a business association with Evans Cooling Systems, Inc. USA, and is offering a complete range of unique patented engine cooling products under the brand name "Evans Waterless Coolants". Opportunities exist for all applications: passenger cars, buses & trucks, construction, agriculture, stationary power generator engines, motorcycles, defense equipment, ships and aircrafts. Original equipment manufacturers can take advantage of Evans patented waterless cooling technology when offering advanced engine technologies. Evans waterless cooling technology brings many benefits unachievable with traditional water-based coolants, and can be used for any liquid cooled engine application on earth, sky and sea. Land – Performance improvement, reduced maintenance, peace of mind, less risk. Sea – Corrosion protection, improved safety & trouble free operations. Air – Better performance under extreme operating conditions. 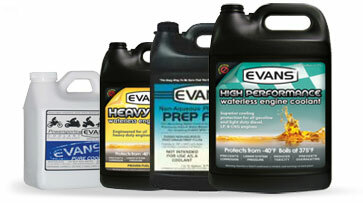 Evans Waterless Coolants are the ONLY 100% waterless engine radiator coolants. 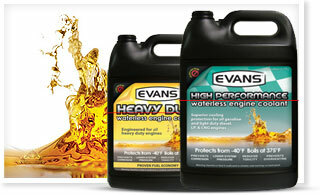 All Evans Waterless Coolants are a chemical blend that result in more efficient cooling due to a higher boiling point. The increased boiling point of the coolant eliminates the occurrence of boil over, cavitation and detonation. Not only do our coolants not boil over, they do not freeze. At extreme cold temperatures, the coolants contract and become extremely thick, not becoming solid and expanding like antifreeze containing water. Because Evans Waterless Coolants do not contain water, electrolysis and corrosion are also eliminated. Water is considered an impurity and before installing Evans Coolant, most of the water must be removed from the cooling system. For a successful conversion water content must be below 3%. In order to take advantage of Evans Waterless coolant, water content should be checked periodically & maintained below 3%. Evans Coolant is maintenance free for the life of the engine. Do not add water in any situation.